Spray bottom and sides of 8-inch square pan with cooking spray. In 3-quart saucepan, cook brown sugar, 3/4 cup butter and the milk over medium heat about 2 minutes, stirring constantly, until butter is melted and sugar is dissolved. Heat to full rolling boil; boil and stir 1 minute. Remove from heat. Add powdered sugar and bourbon. Beat with electric mixer on low speed 1 minute. On medium speed, beat 10 minutes or until mixture begins to hold its shape and is warm to the touch. Quickly stir in pecans. Spread in pan. Refrigerate 2 hours or until firm. Cut into 8 rows by 8 rows. Store tightly covered at room temperature. 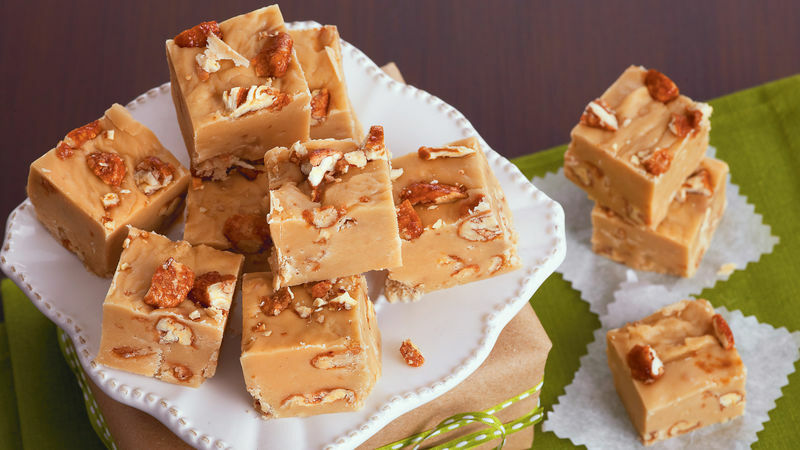 No candy thermometer is needed for this easy fudge. It’s simply boiled, beaten right in the saucepan and then spread in a pan to chill.